This article is about the university in Montreal, Quebec. For other uses, see Concordia University (disambiguation). 1974 by the merger of Loyola College (1896) and Sir George Williams University (1926). AUCC, IAU, ACU, ATS, CARL, CIS, QSSF, CUSID, CBIE, CFS, CUP, IAU. Concordia University (French: Université Concordia; commonly referred to as Concordia) is a public comprehensive university located in Montreal, Quebec, Canada Founded in 1974 following the merger of Loyola College and Sir George Williams University, Concordia is one of the three universities in Quebec where English is the primary language of instruction. As of the 2017–2018 academic year, there were 46,093 students enrolled at Concordia, making the university among the largest in Canada by enrolment. The university has two campuses, set approximately 7 kilometres (4 miles) apart: Sir George Williams Campus is the main campus in Downtown Montreal, in an area known as Quartier Concordia, and Loyola Campus in the residential district of Notre-Dame-de-Grâce. With four faculties, a school of graduate studies and numerous colleges, centres and institutes, Concordia offers over 300 undergraduate and 100 graduate programs and courses. The university's John Molson School of Business is consistently ranked within the top 10 Canadian business schools, and within the top 100 worldwide. Moreover, Concordia was ranked 7th among Canadian and 229th among world universities in the International Professional Classification of Higher Education Institutions, a worldwide ranking compiled by the École des Mines de Paris that uses as its sole criterion the number of graduates occupying the rank of Chief Executive Officer at Fortune 500 companies. Concordia is a non-sectarian and coeducational institution, with more than 200,000 living alumni worldwide. The university is a member of the Association of Universities and Colleges of Canada, the International Association of Universities, the Association of Commonwealth Universities, the Canadian Association of Research Libraries, the Canadian University Society for Intercollegiate Debate as well as the Canadian Bureau for International Education and the Canadian University Press. The university's varsity teams, known as the Stingers, compete in the Quebec Student Sport Federation of Canadian Interuniversity Sport. Although the roots of its founding institutions go back more than 160 years, Concordia University was formed on August 24, 1974, through the merger of Loyola College (1896) and Sir George Williams University (1926). In February 16, 2017, Concordia University recognized that it is located on unceded Indigenous lands. Loyola College traces its roots to an English-language program at the Jesuit Collège Sainte-Marie de Montréal (today part of the Université du Québec à Montréal) at the Sacred Heart Convent. In 1896, Loyola College was established at the corner of Bleury Street and Saint Catherine Street. Loyola College was named in honour of Ignatius of Loyola, founder of the Society of Jesus. On March 10, 1898, the institution was incorporated by the Government of Quebec and became a full-fledged college. The same year, following a fire, the college was relocated, further west on Drummond Street, south of Saint Catherine. Although founded as a collège classique (the forerunners of Quebec's college system), Loyola began granting university degrees through Université Laval in 1903. The college moved into the present west-end campus on Sherbrooke Street West in Notre-Dame-de-Grâce in 1916. The School of Sociology opened in 1918. In 1920, the institution became affiliated with the Université de Montréal, which began granting degrees instead of Université Laval. Memorial bronze honour roll plaques in the entrance hall, administrative offices are dedicated to those from Loyola College who fought in the First and Second World Wars and the Korean War. The inter-war period was marked by the shift of education in the institution, the "collège classique" education was replaced by humanistic education (Liberal Arts College) in 1940, and Loyola became a four-year university. Loyola College never became a chartered university, and never had the ability to grant its own university degrees. Theology and philosophy were taught to all students until 1972. In 1940, the Faculty of Science and the Department of Engineering, which became a faculty in 1964, were created. In addition to providing the same undergraduate programs as other colleges, the institution also offered innovative fields of study at the time, such as exercise science and communication studies. Students could enrol in academic majors starting in 1953 and honours programs in 1958. Students graduating from Loyola could afterwards pursue graduate-level education in other universities, with a few earning Rhodes Scholarships. Starting in 1958, Loyola also began offering its first evening courses for students not being able to go to school full-time. New courses were given in library science and faith community nursing. Since its creation, Loyola College had welcomed almost exclusively young English-speaking Catholic men as students. It became co-ed in 1959 and became less homogeneous with the ever-increasing number of foreign students. Obtaining a university charter was an important issue in the 1960s. Although many wanted the Loyola College to become Loyola University, the Quebec government preferred to annex it to Sir George Williams University. 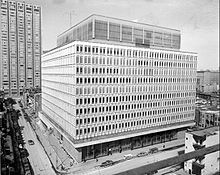 Negotiations began in 1968 and ended with the creation of Concordia University on August 24, 1974. In 1851, the first YMCA in North America was established on Ste-Helene street in Old Montreal. Beginning in 1873, the YMCA offered evening classes to allow working people in the English-speaking community to pursue their education while working during the day. Sixty years later, the Montreal YMCA relocated to its current location on Stanley Street in Downtown Montreal. In 1926, the education program at the YMCA was re-organized as Sir George Williams College, named after George Williams, founder of the original YMCA in London, upon which the Montreal YMCA was based. In 1934, Sir George Williams College offered the first undergraduate credit course in adult education in Canada. Sir George Williams College became Sir George Williams University (SGWU) in 1948, when it received a university charter from the provincial government, though it remained the education arm of the Montreal YMCA. SGWU expanded into its first standalone building, the Norris Building, in 1956. It established a Centre for Human Relations and Community Studies in 1963. SGWU continued to hold classes in the YMCA building until the construction of the Henry F. Hall Building in 1966. The university gained international attention in 1969, when a group of students occupied and destroyed the Hall Building's 9th floor computer lab (see Sir George Williams Computer Riot). Following several years of discussions and planning, Sir George Williams University merged with Loyola College to create Concordia University in 1974. Concordia provided students with representative student organizations and greater power over administrative decisions at the university. In 1968, in the wake of the Parent Commission Report, which recommended for the secularization of Quebec's educational system, the Quebec government asked Loyola College and Sir George Williams University to consider some form of union. The proposed merger was discussed by the Loyola-Sir George Williams Joint Steering Committee, a committee created to analyze all forms of possible mergers of the two institutions. It was proposed, in 1969, to create a university federation that allowed students to take courses at both campuses without paying additional fees. There is also mention of a shuttle bus service linking the remote facilities 7 km (4.3 mi) apart. Criticized for the difficulties encountered by the cohesion of the various departments and faculties, this option was set aside, but not totally rejected by the Joint Steering Committee. The Joint Committee of Representatives of the Board of Trustees of Loyola College and the Board of Governors of Sir George Williams University was formed in December 1971 and produced in the fall of 1972, a document outlining the basis of a university with two campuses. While a number of possible models were considered, including that of a loose federation, the solution finally adopted was that of an integrated institution, Concordia University, operating under the existing charter of Sir George Williams University. Following several revisions in November 1972, the document became the main plan of the proposed merger. It was accepted by both institutions, which began the process of consolidating their operations. In early 1973, the two institutions announced the merger would take place that fall. However, legal and administrative procedures delayed the merger for another year. On August 24, 1974, the Government of Quebec recognized the merger, thus creating Concordia University. The name was taken from the motto of the city of Montreal, Concordia salus (meaning "well-being through harmony"). When you join together two lively institutions, each with its own philosophies and ways of doing things, each firmly dedicated to freedom of thought and speech, you must expect a measure of friction. We look forward now to a new period of creative friction. The legal existence of Concordia dates from August 24, 1974. The integration of the various faculties of the two institutions into a coherent whole took several years. The five faculties of the new university were a combination of existing faculties and departments prior to the merger. There was a Faculty of Commerce, a Faculty of Science and Faculty of Arts at Sir George Williams University. Additionally, there was a Faculty of Arts and Science from Loyola College. The Faculty of Engineering of both institutions had previously been combined. The Faculty of Fine Arts was created in 1976. The first phase of combination of the Faculties of Arts and Science began in 1977 and ended in 1985. In the late 1980s, the Georges P. Vanier Library on the Loyola Campus was enlarged, while in 1992, the library on Sir George Williams Campus moved to the new J.W. McConnell Building. The Norris Building was closed the same year. On August 24, 1992, Valery Fabrikant, a Mechanical Engineering professor, shot five colleagues, killing four, on the ninth floor of the Hall Building. Fabrikant was convicted of the murders and sentenced to life imprisonment. The university erected a memorial to the slain professors (four granite tables) in the Hall Building lobby. Starting in 1998, the university entered a major phase of expansion to meet its growing student enrolment. In August 2003, Concordia inaugurated the Richard J. Renaud Science Complex on Loyola Campus. In 2005, the university launched a major urban redevelopment project in the neighbourhood surrounding Sir George Williams Campus known as the Quartier Concordia. That same year, the Engineering, Computer Science and Visual Arts Integrated Complex opened its doors on Saint Catherine Street West between Guy Street and Mackay Street. In September 2009, the university marked the opening of the new building for the John Molson School of Business. In September 2015, the university held a ribbon cutting for the District 3 Innovation Centre's new space on the sixth floor of Concordia's Faubourg Building. 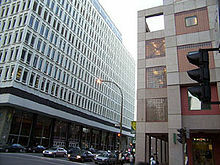 The university has two campuses, set approximately 7 km apart: Sir George Williams Campus in the downtown core of Montreal, in an area known as Quartier Concordia (at the Guy-Concordia Metro station), and Loyola Campus in the residential west-end district of Notre-Dame-de-Grâce. They are connected by free shuttle-bus service for students, faculty and staff. Concordia University has two main library locations: the R. Howard Webster Library located in the J.W. McConnell Building of Sir George Williams Campus, and the Georges P. Vanier Library on Loyola Campus. Concordia Libraries house several special and unique collections including the Azrieli Holocaust Collection and the Irving Layton Collection. Most special collections are located in the Vanier Library. The Libraries also maintains the university's institutional repository, Spectrum. The Concordia Libraries are members of the Canadian Association of Research Libraries. Concordia University Libraries also has partnerships with the Canadian Research Knowledge Network and The Data Liberation Initiative. Concordia University's Hall Building houses The Leonard & Bina Ellen Art Gallery. Samuel Schecter, an art enthusiast and businessman, set up two funds in 1962 to be used for the purchase of Canadian art at Sir George Williams University and at Loyola College (Montreal). When Sir George Williams University and Loyola College merged under the name Concordia in 1974 their respective art collections were also combined. The collection of the Leonard & Bina Ellen Gallery consists of 1700 paintings, sculptures, prints, photographs and videos, many of the works by 20th-century Canadian artists. The Concordia University Archives house official records of, or relating to, or people/activities connected with Concordia University and its two founding institutions. The collection consists of manuscripts, texts, photographs, audio-visual material and artifacts. In 2001, Concordia embarked on a mission to develop and expand the quality of the downtown campus, and to revive the west end in Montreal. The university has also acquired the historic Grey Nuns motherhouse near its Sir George Williams Campus, for $18 million. Built in 1871, it would alone double the size of the current downtown campus. From 2007 to 2022, the university will begin occupying the building in four separate phases. The large property will house the faculty of Fine Arts and possibly the Mel Hoppenheim School of Cinema, and other departments. Currently the Grey Nuns building is only partially owned by Concordia (about 1/3 of the building on Saint-Mathieu Road), but full control of the building will be given to Concordia University in 2011. Concordia Residence Life currently houses nearly 250 students each year in the Grey Nuns Building. The dorm rooms are among the largest in the country, as many of the rooms have been transformed from when the section of the Grey Nuns Building was occupied by the Grey Nuns. The site was designated a National Historic Site of Canada in 2011. The Engineering, Computer Science and Visual Arts Integrated Complex (EV Building) at Saint Catherine Street and Guy Street was opened in September 2005. The building is directly connected to the Guy-Concordia Metro station and also houses Le Gym, a facility of Athletics and Recreation. Across the street, the 100-year-old TD Canada Trust building was donated to Concordia in 2005 by the Toronto-Dominion Bank. The university had planned to begin using this space in 2006. Construction of the new John Molson School of Business (JMSB) Building that is located on the corner of Guy and de Maisonneuve streets began in February 2007. The Quebec Minister of Education, Recreation and Sports, Jean-Marc Fournier, on October 30, 2006, announced an investment of $60 million towards the construction of the new building. The minister made the announcement during a ceremony at Concordia. The government's $60 million represents about half of the total construction costs. Construction started on January 22, 2006, and the building was completed and opened in September 2009. The 15-story building now houses the JMSB's 6,000 full and part-time students under the same roof for the very first time. The Departments of Contemporary Dance, Theatre and Music at Concordia have also moved into the new JMSB Building. It is connected to the EV Building by a tunnel under Guy Street. In April 2010, a 120-metre tunnel completed the underground connections of the Guy-Concordia Metro station with the Henry F. Hall Building and the J.W. McConnell Building. Quartier Concordia is a neighbourhood redevelopment project centred around Concordia University's Sir George Williams Campus in downtown Montreal. Bordered by Sherbrooke Street to the north, Saint-Mathieu Street to the west, René Lévesque Boulevard to the south and Bishop Street to the east, the district is designed to be a green urban campus that will improve the use and quality of public places and spaces, student life on campus and transportation. As part of the redesign, the small Norman Bethune Square has been redesigned and enlarged. Sidewalks in the area will also be widened, with additional trees. As of September 2010, an underground tunnel links the university's Henry F. Hall and J.W. McConnell buildings with the Guy-Concordia Metro station. The hallway was completed in Spring 2010. However, a project to create a green space on Mackay Street has been put on hold. Concordia is conducted by its president, provost and vice-presidents. The Board of Governors and the Senate manage the university's affairs and academic integrity. The President and Vice-Chancellor and the senior leadership are suppose to ensure transparency and accountability of the administration. The administration is supervised by the Board of Governors and Senate. According to the "Charter of Concordia" University, the University’s highest governing body is the Board of Governors, which has final authority over the affairs of the University, the senate derives its authority from the Board of Governors. The university has four faculities and one graduate school. Academic departments/ institutes of the university run under the supervision of respectve faculty. Like Concordia's Department of Applied Human Sciences and Simone de Beauvoir Institute are operated under Faculty of Art and Science. In 2017-18 year, Concordia received $473.7 million in revenue. Sixty percent of the university's revenue comes from grants of the Quebec government, which are given based on the student population. In the same year the university also received 194.8 million from its endowment. In November 2017, Concordia launched "Campaign for Concordia".The campaign's main target is to raise $250 million in order to support "nine strategic directions" which will adhere Concordia's position as "Canada’s next-generation university". In January 2018, President of the university Alan Shepard said that the university has already reached "more than halfway" of its goal. As of 2019, the campaign is still going on. Students enter the university in September, or, in some cases, in January or May. An undergraduate degree normally takes three or four years studying full-time to complete, a Master's takes from a year and a half to three years, and a Ph.D. is at least four years long. Certificates and diplomas usually take no longer than a year and a half to complete. Concordia has more than 300 undergraduate programs, divided into four faculties. The faculties are the Faculty of Arts and Science, the Gina Cody School of Engineering and Computer Science, the Faculty of Fine Arts and the John Molson School of Business. Students are normally enrolled in one of these faculties, but they may take courses from any of the others as part of their studies. Class sizes vary from 30 to 400 students. The School of Graduate Studies offers about 70 programs leading to master's and doctoral degrees, as well as graduate diplomas and certificates for professionals seeking to upgrade their knowledge and skills. The Centre for Continuing Education offers programs and services designed to make it easier for students to attend the university and be successful at their studies. The Institute for Co-operative Education administers more than 40 bachelor's and master's programs in an alternating co-op work study format. Concordia's co-op programs enable students to enrich their learning by participating in career-relevant 12-17 week full-time, paid work terms. Depending on their faculty and major, co-op students will usually graduate with a minimum of 12 months of academically relevant work experience. There are also Industrial Experience and Professional Experience options in certain disciplines that enable students to participate in a summer-only work term. Concordia is a member of the Canadian Association for Co-operative Education (CAFCE). During the 2017–2018 academic year, there were 37,053 undergraduate students, 9,040 graduate students and 4,222 continuing education students enrolled at Concordia University. Concordia University's Faculty of Arts and Science contains 21 departments and seven colleges, schools and institutes in the humanities, sciences and social sciences at the undergraduate and graduate levels. There are over 293 programs, offering more than 2,400 courses. There are 500 full-time and 400 part-time faculty members. During the 2010–2011 academic year, there were 15,767 undergraduate and 2,103 graduate students enrolled in the faculty. In addition to regular academic programs, the Faculty of Arts and Science also includes three colleges, two schools and two institutes. These are the Liberal Arts College, the Loyola College for Diversity and Sustainability, the School of Community and Public Affairs, the School of Canadian Irish Studies, the Science College, the Simone de Beauvoir Institute and the Concordia Institute for Canadian Jewish Studies. The Loyola College for Diversity and Sustainability (formerly Loyola International College) is an interdisciplinary college of Concordia University on Loyola Campus, the original site of Loyola College. It offers minor programs in Diversity and the Contemporary World and Sustainability Studies. At the undergraduate level, the Faculty of Arts and Science offers both Bachelor of Arts (BA) and Bachelor of Science (BSc) programs with majors ranging from economics, political science and sociology to actuarial mathematics, biology and ecology. The Gina Cody School of Engineering and Computer Science, formerly known as Faculty of engineering and computer science, is named after Concordia's alumni Gina Cody, who donated $15 million to the University in 2018. In response, the university renamed its faculty of engineering and computer science in her honour, making it the first engineering school to be named after a woman in Canada and globally. In 2018, Maclean's has ranked its programmes as one of the best in Canada. The faculty offers 86 undergraduate and graduate-level programs in the following disciplines: Aerospace Engineering, Building Engineering, Civil Engineering, Computer Engineering, Computer Science, Electrical Engineering, Industrial Engineering, Information Systems Security, Mechanical Engineering, Quality Systems Engineering and Software Engineering. The engineering programs are all accredited by the Canadian Engineering Accreditation Board (CEAB). During the 2010–2011 academic year, there were 3,501 undergraduate and 2,438 graduate students enrolled in the faculty. The Troitsky Bridge Building Competition brings together engineering students from across Canada and parts of the United States. Teams of students representing their universities must build a 1-metre-long bridge using only regular popsicle sticks, toothpicks, dental floss, and white glue. A panel of judges grades the bridges based on originality and presentation while a hydraulic loading device is used to determine the maximum load and performance. The Faculty of Fine Arts offers 60 programs at the undergraduate and graduate levels. It includes nine departments and four research institutes. During the 2010–2011 academic year, there were 3,153 undergraduate and 555 graduate students enrolled in the faculty. Among the departments is The Mel Hoppenheim School of Cinema. It is informally identified as MHSoC, and accepts 200 students a year, for study in the fields of animation, film production and film studies. It is the largest, university-based centre for the study of film animation, film production and film studies in Canada. The John Molson School of Business (JMSB) (formerly the Faculty of Commerce and Administration) offers 48 different programs at the undergraduate and graduate levels from six different departments. The departments are Accountancy, Finance, Marketing, Management and Supply Chain & Business Technology Management. During the 2014-15 academic year there were 7,768 undergraduate students and 1,454 graduate students enrolled, and JMSB has 51,000 alumni. The JMSB is accredited by the Association to Advance Collegiate Schools of Business (AACSB). The business school has been located in a LEED silver-certified building. Four residence buildings are available for students who wish to live on campus: Grey Nuns Residence, Jesuit Residence, Hingston Hall (HA), and Hingston Hall (HB). For students who choose to live off campus, the Concordia Student Union's Off-Campus Housing and Job Bank (HoJo) offers classified ads, legal advice, and safety resources. Concordia's "sustainability hub" works for sustainable development. In 11 February, 2019, Concordia became the first university in Canada whuch issued a sustainable bond. According to the university webpage the bond will "generate environmental and social benefits as defined by the United Nation's Sustainable Development Goals". According to Denis Cossette, the university’s chief financial officer, "the $25-million senior unsecured bond offers investors a 3.626 per cent yield and has a duration of 20 years". Because of this bond, Concordia would be able to issue sustainable bonds instead of green bonds. Concordia University's athletic teams are called the Concordia Stingers. They compete with other schools in Canadian Interuniversity Sport, and more specifically, in the Quebec Student Sports Federation and the Quebec University Football League. The university has 10 varsity teams. In the fall, teams compete in Canadian football, men's and women's soccer, men's and women's rugby union and sport wrestling. There are female and male wrestlers on the team from year to year, and they compete as one team. In the winter, teams compete in men's and women's ice hockey and men's and women's basketball. The Concordia Stingers women's ice hockey team won the Canadian national championships in 1998 and 1999. The Stingers baseball club beat Cape Breton University Capers 12-2 to win the 2009 National Baseball Crown. The Concordia Student Union (CSU) represents undergraduate students. Its membership totals more than 33,000 students. Concordia students voted in favour of accreditation of their student union in a referendum in December 2000. As a result, the CSU is now legally accountable only to its student constituents. Another noteworthy aspect of Concordia University is the number of longstanding fee-levy groups which provide numerous services, funded by the student population in the form of per-credit fees. These include the People's Potato, which offers a four-course vegan meal, the anti-capitalist grocery store, The Frigo Vert, and the Coop Bookstore. Concordia University is home to local and international fraternities and sororities. The Delta Phi Epsilon sorority, represented by the Beta Pi chapter, was established at Concordia in 1994. The Zeta Tau Omega sorority (ΖΤΩ) was founded in 1968 by six women studying at Montreal. Mu Omicron Zeta fraternity (MOZ) was founded in 1992. The Brotherhood of Omicron is another locally based fraternity at Concordia. Tau Kappa Epsilon (TKE) fraternity has its Kappa Chi (KX) Chapter at Concordia, which was founded in 1967 at Loyola College. Alpha Epsilon Pi (ΑΕΠ) — the largest fraternity in Canada—established a chapter at Concordia in 2015. Concordia University has a campus radio station, CJLO, and television station, CUTV. Concordia also has three student-run newspapers, The Link, The Concordian and French-language L'Organe. The Concordian and L'Organe are members of Canadian University Press (CUP); The Link left the CUP network in 2012. The university also assists in the publishing of the only student-run, bilingual literary/arts magazine The Void, founded in 2002, as well as arts magazine Interfold. As the 1990s progressed, student activism began growing, coming to a head in 1999 with the election of the first in a series of radical slates to the Concordia Student Union. Under the presidency of Rob Green, a referendum regarding of a strike garnered 2,284 votes of support. This was an unusually strong show of support, as student governments at Concordia are often elected on the basis of less than 1000 votes in their favor. The strike lasted from November 3 to 5 and targeted a range of issues, including student representation in the university senate, corporate presence and advertising on campus, and government. There were several demonstrations in which both protesters and police were reported to be injured. On September 9, 2002, a scheduled speech from the then former (and now current) Israeli Prime Minister Benjamin Netanyahu was cancelled following violent pro-Palestinian riots inside the Henry F. Hall Building. Protestors claimed that he is a war criminal and there should be no free speech for hate speech. Netanyahu accused protestors of being supporters of terrorism. The event is depicted in a documentary named, Confrontation at Concordia. Concordia's alumni and faculty have achieved fame for their accomplishments in many fields. Distinguished alumni include Mohan Munasinghe, a member of the Nobel Peace Prize-winning Intergovernmental Panel on Climate Change; Barbara Davidson, Pulitzer Prize and Emmy Award winning photographer filmmaker; former governor general Georges Vanier; presidents and Chief Executive Officers of major businesses (Dominic D'Alessandro, Mireille Gingras, Gerald T. McCaughey, L. Jacques Menard); philosopher Keith Heron; authors (E. Annie Proulx, Mordecai Richler, Nino Ricci, Chandra Venugopal); political leaders and ministers; academics (Kim Sawchuk); scientists; actors (Will Arnett, Adam Kelly, Patrick Kwok-Choon, Mylène Dinh-Robic); filmmakers (Moyra Davey, René Balcer, Peter Lenkov, Alex Rice, Lynne Stopkewich, B. P. Paquette, Donald Tarlton, James Tupper, Steven Woloshen, Louise Archambault, Maziar Bahari, Simone Rapisarda Casanova, Yung Chang), musicians (Emily Haines, Prita Chhabra, Julian Kytasty, Régine Chassagne, Sarah Neufeld, Michael Laucke, Richard Reed Parry, Amy Millan, Matthew Otto of Majical Cloudz); athletes (Cammi Granato, Jim Corsi); dance artist Lara Kramer; news anchors (Dareen Abu Ghaida, Mutsumi Takahashi). ^ "History". Who we are. Concordia University. Retrieved April 20, 2012. ^ a b "Concordia University Foundation Annual Report 2017-2018" (PDF). Concordia University Foundation. ^ "Board appoints Graham Carr interim provost". ^ a b c d e f g h i j k l m n o "Fast facts". concordia.ca. Retrieved February 1, 2019. ^ "Concordia University". www.concordia.ca. Retrieved January 25, 2016. ^ "About". www.concordia.ca. Retrieved January 25, 2016. ^ "Campus tours". Retrieved February 18, 2016. ^ "Academics". www.concordia.ca. Retrieved February 18, 2016. ^ "Beyond Grey Pinstripes — The Global 100". Aspen Institute. Retrieved January 16, 2008. ^ "Concordia University". Beyond Grey Pinstripes. 2006–2007. Retrieved July 8, 2009. ^ "Knight Schools 2008". Corporate Knights. Archived from the original on September 29, 2008. Retrieved July 8, 2009. ^ "Knight Schools 2009". Corporate Knights. Archived from the original on October 5, 2009. Retrieved July 13, 2009. ^ "CUAA - 30th Annual General Meeting". Concordia University Alumni Association. Retrieved March 29, 2014. ^ "History". Retrieved February 13, 2013. ^ YMCA History Archived February 2, 2013, at the Wayback Machine YMCA International. ^ History of Sir George Williams University, Concordia University. ^ a b c d e f g "Merger of Loyola College and Sir George Williams University". Concordia University. Retrieved September 16, 2013. ^ Canada. "Concordia University History". Concordia.ca. Retrieved November 20, 2010. ^ Concordia Chronology, Concordia University Records Management and Archives. ^ "Concordia University". The Canadian Encyclopedia. Retrieved September 17, 2013. ^ "Fabrikant Affair". Records Management and Archives. Conconrdia University. Archived from the original on June 6, 2014. Retrieved September 15, 2013. ^ "District 3 receives $1M startup gift, christens new collaborative space". Concordia University. Retrieved September 28, 2015. ^ "Unique Collections". Library.concordia.ca. December 8, 2009. Archived from the original on February 3, 2011. Retrieved November 20, 2010. ^ Canada. "Welcome to Spectrum: Concordia University Research Repository — Spectrum: Concordia University Research Repository". Spectrum.library.concordia.ca. Retrieved November 20, 2010. ^ "Membership - CARL". Carl-abrc.ca. January 25, 2016. Archived from the original on December 8, 2014. Retrieved January 25, 2016. ^ "Partnerships". Concordia University Libraries. Concordia University. March 23, 2005. Retrieved December 23, 2011. ^ Peretz, Ingrid (December 24, 2008). "Montreal nuns moving — with saint's remains". The Globe and Mail. Toronto. Archived from the original on December 25, 2008. Retrieved December 24, 2008. ^ Mother House of the Grey Nuns of Montreal. Directory of Federal Heritage Designations. Parks Canada. Retrieved May 2, 2012. ^ "Concordia's new tunnel is about ready". Fagstein. April 7, 2010. ^ "=Quartier Concordia — Concordia University". Archived from the original on September 16, 2008. Retrieved September 25, 2008. ^ Harvey, Réginald (May 21, 2006). "Urbanisme — Un quartier Concordia au centre-ville". Le Devoir. ^ "Quartier Concordia — Concordia University". Archived from the original on September 16, 2008. Retrieved June 26, 2008. ^ DeWolf, Christopher (February 19, 2008). "Norman Bethune Square's makeover confirmed". Spacing Montreal. Retrieved May 2, 2009. ^ Riga, Andy (April 30, 2009). "Montreal's Worst Construction Zone". Montreal Gazette. Canwest. Archived from the original on May 3, 2009. Retrieved May 2, 2009. ^ "University puts greening of Mackay on hold". News and Events. Concordia University. Archived from the original on May 17, 2009. Retrieved May 2, 2009. ^ "Undergraduate programs". www.concordia.ca. Retrieved January 25, 2016. ^ Canada. "Dean's Message — School of Graduate Studies — Concordia University — Montreal, Quebec, Canada". Graduatestudies.concordia.ca. Retrieved November 20, 2010. ^ Canada. "Homepage — The Centre for Continuing Education — Concordia University — Montreal, Quebec, Canada". Extendedlearning.concordia.ca. Retrieved November 20, 2010. ^ "Departments". Faculty of Arts and Science. Concordia University. Retrieved June 21, 2016. ^ "Colleges, Schools and Institutes". Faculty of Arts and Science. Concordia University. Retrieved May 22, 2012. ^ "Undergraduate programs". Retrieved June 17, 2015. ^ "Concordia University names engineering faculty after female graduate Gina Cody". CTVNews. September 24, 2018. Retrieved September 26, 2018. ^ "Concordia engineering school becomes first in Canada named after a woman as alumna donates $15-million". Retrieved September 26, 2018. ^ "Concordia University alumna donates $15M, faculty of engineering named after her". Global News. Retrieved September 26, 2018. ^ "Concordia University's engineering school is first in Canada to be named after a woman | The Star". thestar.com. Retrieved September 26, 2018. ^ "Homepage". Faculty of Engineering and Computer Science. Concordia University. Retrieved May 22, 2012. ^ "Faculty overview". Faculty of Fine Arts. Concordia University. Retrieved June 21, 2016. ^ "About the School — Mel Hoppenheim School of Cinema — Concordia University — Montreal, Quebec, Canada". Cinema.concordia.ca. Retrieved November 20, 2010. ^ "Departments". concordia.ca. Retrieved June 21, 2016. ^ John Molson School of Business (2016). "About JMSB". Concordia University. Retrieved June 21, 2016. ^ "AACSB Accreditation". John Molson School of Business. Concordia University. Retrieved May 22, 2012. ^ "About JMSB". Retrieved June 17, 2015. ^ a b "Academic Ranking of World Universities 2018". ShanghaiRanking Consultancy. 2018. Retrieved August 18, 2018. ^ "ARWU World Top 500 Candidates 2018". ShanghaiRanking Consultancy. 2018. Retrieved August 18, 2018. ^ a b c "QS World University Rankings - 2019". QS Quacquarelli Symonds Limited. 2018. Retrieved June 8, 2018. ^ a b "World University Rankings 2019". Times Higher Education. TES Global. 2018. Retrieved September 26, 2018. ^ a b "Best Global Universities in Canada". U.S. News & World Report. U.S. News & World Report, L.P. October 29, 2018. Retrieved November 4, 2018. ^ a b "University Rankings 2019: Canada's top Comprehensive schools". Maclean's. Rogers Media. October 11, 2018. Retrieved October 13, 2018. ^ "150 Under 50 Rankings". Times Higher Education (THE). December 17, 2015. Retrieved June 21, 2016. ^ "QS World University Rankings - 2015-16". Top Universities. Archived from the original on March 15, 2015. Retrieved June 17, 2015. ^ "Which MBA? – The Economist". The Economist. ^ "Bloomberg Businessweek: John Molson MBA ranks among the world's best". concordia.ca. Retrieved June 21, 2016. ^ "Academic Ranking of World Universities in Economics / Business - 2015 | 2015 Top 200 Universities in Economics / Business | ARWU-SUBJECT 2015". shanghairanking.com. Retrieved June 21, 2016. ^ "ShanghaiRanking's Global Ranking of Academic Subjects 2016 - Civil Engineering". Retrieved June 21, 2016. ^ "LinkedIn Desirable Jobs Ranking 2014 by Subject - Blog". LinkedIn. 2014. Retrieved November 15, 2014. ^ "LinkedIn Desirable Jobs Ranking 2014 by Subject - Software Development". LinkedIn. 2014. Retrieved November 15, 2014. ^ "CSRankings: Computer Science Rankings". ^ "Concordia becomes first university to issue sustainable bonds in Canada". Financial Post. ^ "Concordia becomes first university to issue sustainable bonds in Canada". Montreal Gazette. ^ "Concordia Department of Recreation and Athletics | News [Concordia wins national baseball crown]". Athletics.concordia.ca. October 26, 2009. Retrieved November 20, 2010. ^ Bokser, Howard. "Concordia University Magazine". Magazine.concordia.ca. Retrieved November 20, 2010. ^ "Official Delta Phi Epsilon: Beta Pi Chapter Site". Delta Phi Epsilon, Beta Pi Chapter. Retrieved on: September 7, 2009. ^ "History" Archived July 24, 2011, at the Wayback Machine. Zeta Tau Omega Sorority. Retrieved on: August 29, 2009. ^ . Zeta Tau Omega Sorority. Retrieved on: August 29, 2009. ^ Mu Omicron Zeta. Retrieved on: September 27, 2007. ^ The Brotherhood of Omicron. Retrieved on: September 27, 2007. ^ "TKE-KX Chapter". Tkekx.com. Retrieved November 20, 2010. ^ "TKE-KX Chapter History". Tkekx.com. Retrieved November 20, 2010. ^ "AEPi Concordia - Gamma Lambda Colony". Facebook. Retrieved September 8, 2015. ^ "l'Organe magazine, Montréal". Lorgane.org. Retrieved November 20, 2010. ^ Canadian Press (January 15, 2003). "Concordia U. regrets anti-Netanyahu riot". CTV.ca. Archived from the original on June 1, 2008. Retrieved May 16, 2008. ^ Stein, Howard (2005). "The debate on Canadian campuses: bringing back democracy and the spirit of scholarship". Inroads: A Journal of Opinion. Winter-Spring. Austin, Kevin. "[Institutions] Concordia University (Montréal)." eContact! 11.2 — Figures canadiennes (2) / Canadian Figures (2) (July 2009). Montréal: CEC. Bissonette, L. A. (1977). "Loyola of Montreal: A Sociological Analysis of an Educational Institution in Transition between 1969 and 1974" (PDF). M.A. Thesis, Concordia University. OCLC 74374291. Wikimedia Commons has media related to Concordia University Montreal. The University of New Brunswick (UNB) is a public university with two primary campuses in Fredericton and Saint John, New Brunswick. It is the oldest English-language university in Canada, and among the oldest public universities in North America. UNB was founded by a group of seven Loyalists who left the United States after the American Revolution. The Université du Québec à Montréal (UQAM) is a public university based in Montreal, Quebec, Canada. It is a French-language university and is the largest constituent element of the Université du Québec system. Carleton University is a public comprehensive university in Ottawa, Ontario, Canada. Founded in 1942 as Carleton College, a private, non-denominational evening college to serve veterans returning from World War II, the institution was chartered as a university by the provincial government in 1952 through the The Carleton University Act. The legislation was subsequently amended in 1957 to give the institution its current name. The university moved to its current campus in 1959, and would expand rapidly throughout the 1960s amid broader efforts by the provincial government to increase support to post-secondary institutions and expand access to higher education. Bishop's University is a small liberal arts college in Lennoxville, a borough of Sherbrooke, Quebec, Canada. It is one of three universities in the province of Quebec that teach primarily in English. The university shares a campus with its neighbour, Champlain College Lennoxville, an English-language public college. It remains one of Canada's few primarily undergraduate universities, and is linked with three others in the Maple League. Established in 1843 as Bishop's College and affiliated with the University of Oxford and the University of Cambridge in 1853, the school remained under the Anglican church's direction from its founding until 1947. Since that time, the university has been a non-denominational institution. Bishop's University has graduated fifteen Rhodes Scholars. It is ranked number one in Canada for student satisfaction by Maclean's magazine. Université Laval is a French-language, public research university in Quebec City, Quebec, Canada. The University was founded by royal charter issued by Queen Victoria in 1852, with roots in the founding of the Séminaire de Québec in 1663 by François de Montmorency-Laval, making it the oldest centre of higher education in Canada and the first North American institution to offer higher education in French. The university, whose campus was erected from the 1950s onward in the suburban borough of Sainte-Foy–Sillery–Cap-Rouge, is ranked among the top ten Canadian universities in terms of research funding and holds four Canada Excellence Research Chairs. The Université de Sherbrooke is a large public French-language university in Quebec, Canada with campuses located in Sherbrooke and Longueuil, a suburb of Montreal approximately 130 km (81 mi) west of Sherbrooke. It is one of two universities in the Estrie region of Quebec, and the only French-language university for the region. Guy-Concordia station is a Montreal Metro station in the borough of Ville-Marie in Montreal, Quebec, Canada. It is operated by the Société de transport de Montréal (STM) and serves the Green Line. The station opened on October 14, 1966, as part of the original network of the Metro. It has consistently been one of the network's busiest stations, ranking 5th in 2000, 2001, 4th from 2002 to 2007, and 3rd since 2008. Loyola College was an anglophone Jesuit college in Montreal, Quebec, Canada. It ceased to exist when it was incorporated into Concordia University in 1974. A portion of the original college remains as a separate entity called Loyola High School. Loyola High School is a private Catholic school for boys in grades 7–11 located in Montreal. It was established in 1896 by the Society of Jesus as part of Loyola College, at the request of the English Catholic community in Montreal. It is named after St. Ignatius of Loyola, who founded the Jesuit Order in 1534. The John Molson School of Business (JMSB) is a business school located in Montreal, Quebec, Canada. JMSB was established in 1974 by Concordia University. With access to six universities and twelve junior colleges in an 8 kilometer (5 mi) radius, Montreal, Quebec (Canada) has the highest proportion of post-secondary students of all major cities in North America. This represents roughly 248,000 post-secondary students, one of the largest numbers in the world. The Macdonald Campus of McGill University houses McGill's Faculty of Agricultural and Environmental Sciences (FAES), which includes the Institute of Parasitology, the School of Human Nutrition and the McGill School of Environment. It is located in Sainte-Anne-de-Bellevue, Quebec, in the West Island region of the Island of Montreal. The property is also the home of John Abbott College. McGill University is a public research university in Montreal, Quebec, Canada. It was established in 1821 by royal charter, granted by King George IV. The university bears the name of James McGill, a Montreal merchant originally from Scotland whose bequest in 1813 formed the university's precursor, McGill College. The Faculty of Engineering is one of the constituent faculties of the McGill University in Montreal, Quebec, Canada, offering undergraduate and graduate degrees in chemical, civil, computer, electrical, mechanical, bio-engineering, materials and mining engineering, as well as the schools of architecture and urban planning. The faculty also teaches courses in bio-resource engineering and in biomedical engineering at the masters level. The Université de Montréal is a French-language public research university in Montreal, Quebec, Canada. The university's main campus is located on the northern slope of Mount Royal in the Outremont and Côte-des-Neiges boroughs. The institution comprises thirteen faculties, more than sixty departments and two affiliated schools: the Polytechnique Montréal and HEC Montréal. It offers more than 650 undergraduate programmes and graduate programmes, including 71 doctoral programmes. The Concordia Student Union is the organization representing undergraduate students at Concordia University in Montreal, Quebec, Canada. Its membership totals more than 33,000. Higher education in Quebec differs from the education system of other provinces in Canada. Instead of entering university or college directly from high school, students in Quebec leave secondary school after Grade 11, and enter post-secondary studies at the college level, as a prerequisite to university. Although both public colleges (CEGEPs) and private colleges exist, both are colloquially termed CEGEPs. This level of post-secondary education allows students to choose either a vocational path or a more academic path. 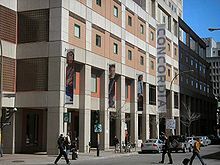 Concordia University Library is the library system at Concordia University in Montreal, Quebec, Canada. Concordia University has two library locations, the R. Howard Webster Library located in the J.W. McConnell Building of the Sir George Williams Campus and the Georges P. Vanier Library located at the Loyola Campus. On September 2, 2014, the Library opened the Grey Nuns Reading Room, a silent study space for Concordia students located in the former Chapel of the Invention of the Holy Cross. The Reading Room has seating for 192 students, with an additional 42 chairs in small reading rooms. A student of Political Science was the first to enter.